Roasted garlic. Butter. Cream. Potatoes. Otherwise known as the fourth dish in ‘My Ultimate Thanksgiving’ menu (here are the first, second and third) Let me introduce you, because trust me, you will want to become friends with these potatoes. 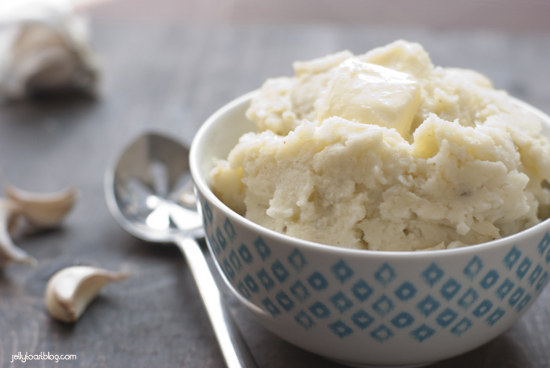 I used to have a weird thing with homemade mashed potatoes. I didn’t really like them. I know, I know. Let me double back for a minute. This was many moons ago, and I had only ever made them once or twice. And they always turned out watery, yet oddly dry at the same time. How can something be both watery and dry? I couldn’t wrap my head around their unusual texture. 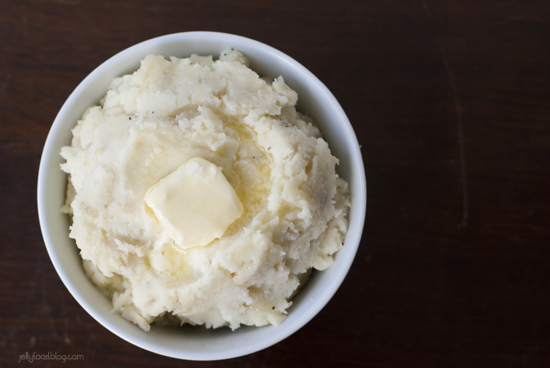 It turns out, in my attempt to keep things ‘light’ I was missing the crucial elements that make mashed potatoes smooth, creamy and fluffy: butter and cream. Correction: lots of butter and lots of cream. Or at least a lot more than I had been willing to use in the past. One year for Thanksgiving, I was assigned/picked to bring mashed potatoes to the family feast. Instead of shying away, I decided to find a recipe that was going to be fool proof, then make it and not really tell people exactly how much butter and cream were actually floating around in their potatoes. I found this intriguing, but a bit complicated, recipe for roasted garlic mashed potatoes from Michael Chiarello. His recipe called for 2lbs of potatoes, 1 1/2 cups of heavy cream, and 3 sticks of butter. I was a bit shocked at first. Holy smokes, 3 sticks of butter for 2 lbs of potatoes? Wow. Well, they were bound to taste better than my previous attempts, so set off to make these buttery spuds. While making them, I stopped adding butter after two sticks because they were turning into potato soup instead of mashed potatoes, so I figured perhaps there was a typo in the recipe. No big deal. With only two sticks of butter, these were bound to have a lesser chance of sending my family members into cardiac arrest around the dinner table. These potatoes did not disappoint. Everyone loved them and no one got sent to the hospital. The following year, I wanted to make them again. But as I mentioned, the original recipe was a bit involved. It called for soaking the potatoes overnight, making a paste with the garlic, and again, the 3 2 sticks of butter. I had come around to admit that the butter and cream were absolute necessities for creamy and dreamy potatoes, but I needed to simplify this recipe a bit and also just experiment with using just a touch less butter. I swapped Russet Potatoes for the Yukon Golds as they are just so readily available this time of year. I dropped the cream from 1 1/2 cups to 1 cup and the butter down to just one stick. It’s practically diet food now, people. My alterations were successful and everyone still loved them. They are now a staple on ‘My Ultimate Thanksgiving’ menu. I’m getting hungry just thinking about them. Excuse me while I go sneak another bite. Remove the loose outer, papery skin off of the garlic heads. Using a sharp knife, cut off the tops (leaving root end intact) of the garlic heads, exposing the top of each garlic clove. 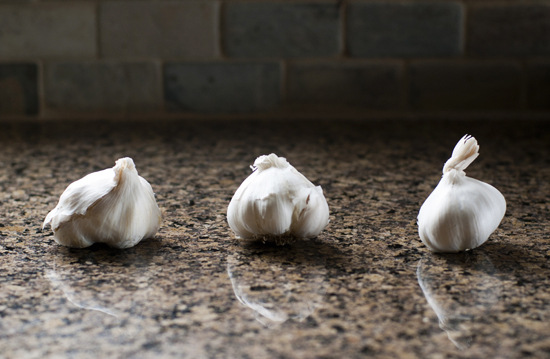 Place the trimmed garlic heads, cut side up, on a large sheet of aluminum foil. Drizzle with olive oil. 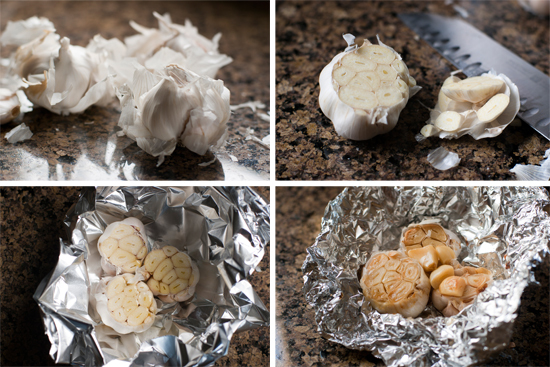 Fold up the sides and top of the foil around the garlic heads. Fold the ends of the foil together to create an enclosed pouch. Place pouch on a sheet pan and roast in the oven for 40-60 minutes or until garlic is soft, golden brown and fragrant. Remove from oven and allow to cool. Scrub, peel and chop the potatoes into 1 inch cubes. Place cubes in a large pot of cold water. Add about 1 Tablespoon of salt, cover and heat the potatoes on medium high heat until boiling. 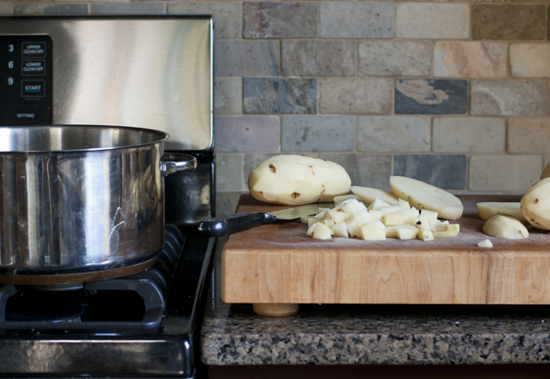 Uncover and simmer until potatoes are tender and can be pierced easily with a fork. Drain potatoes well. Return the empty pot to the stove on low heat and add the cream and butter. Stir constantly allowing the butter to melt into the cream. Squeeze the roasted garlic cloves from heads and add to the cream mixture. Stir for 3 minutes allowing the garlic to infuse the cream. Return the potatoes to the pot. Stir with a wooden spoon until the cream mixture has coated the potatoes. Remove from heat and mash potatoes with a potato masher. Add salt and pepper to taste. 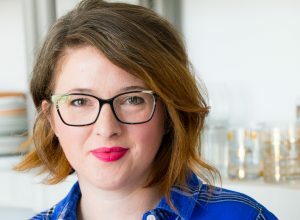 Bookmarking these to make this winter when we’ll be in desperate need of comfort food! I’m avoiding white potatoes right now but I think I’ll try these with sweet potatoes instead. Yum!